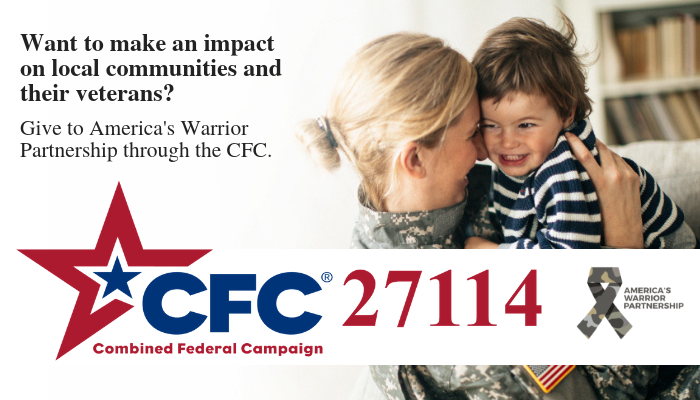 WASHINGTON, October 1, 2018 – America’s Warrior Partnership is participating in the 2018 Combined Federal Campaign (CFC), the world’s largest annual workplace charitable giving campaign. Funds donated by military and civilian federal employees will support the organization’s mission of empowering communities to empower veterans. Federal employees who participate in CFC provide invaluable support that directly backs local programs serving veterans. Since 2014, we have built relationships with more than 44,000 warriors and we will raise that number even higher thanks to the help that will be donated during this year's campaign. · Community Integration – A proven service model that provides veteran-serving organizations with the tools to implement a customized program that is responsive to the needs of local veterans, families and caregivers. · WarriorServe – A reliable, cost-effective and secure information system that streamlines the collection and analysis of critical veteran information, enabling community organizations to focus on providing care and services rather than data input. · Operation Deep Dive – A four-year study conducted in partnership with University of Alabama researchers and the Bristol-Myers Squibb Foundation to examine the factors involved in suicide and early mortality due to self-harm among veterans. The study is the first of its kind to analyze the impact of community environments and less-than-honorable discharges on all veterans across the spectrum of service, gender and age. For more information on America’s Warrior Partnership and opportunities to support the organization’s mission, visit www.AmericasWarriorPartnership.org.